The GO Bond allocated $800 million to infrastructure projects throughout Kansas City. With several inches of rain falling throughout the metro area, 41 Action News got a status update on the flood control projects. KANSAS CITY, Mo. — The GO Bond allocated $800 million to infrastructure projects throughout Kansas City. 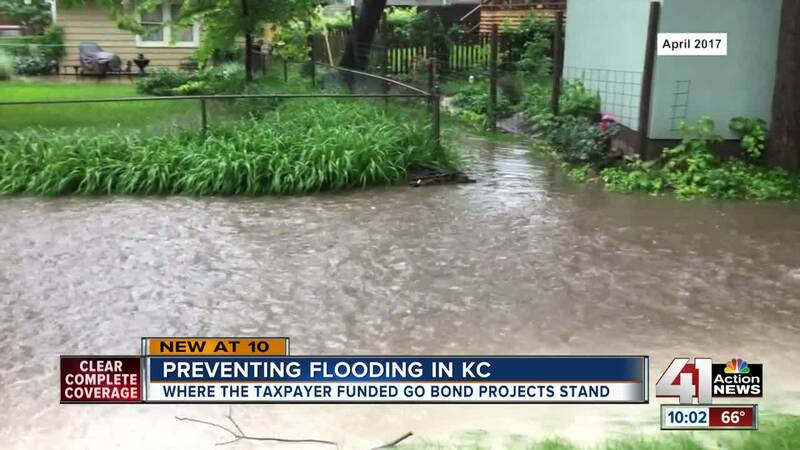 With several inches of rain falling throughout the metro area, 41 Action News got a status update on the flood control projects. In May 2018, Kansas City leaders approved a five-year plan for the GO Bond. When it comes to flood control, three projects are underway. Dodson, Turkey Creek and the Swope Park area. All of them are industrial. Scott Wagner, Mayor Pro-Tem and Kansas City councilman said when it comes to the neighborhoods, "They have not been forgotten. What we are trying to do first is get rid of all those projects that were part of the federal money that we had received." Brookside, Indian Creek and Mill Creek are slated to get flood control work in about two-to-three years. Even though it should help significantly, the problems won't all go away. Tom Kimes, Stormwater Utility Engineering Manager for KC Water, said that even after the work, "We will always have high water so what this does is it provides flood protection but we will always have flooding. The city is large enough that we have about a 50-year flood somewhere in the city, every single year." In all $150 million is set aside for flood control over 20 years. Right now, the city is in year two of the effort.